That Boutique-y Whisky Company has crafted trade-mark labels and fine contents. One of our Mumbai Whisky Ladies picked this particularly bottle up some time ago and we’ve been patiently waiting for th right opportunity. Some loved this one. Others found the blend so approachable that following with this single malt was a bit of a jolt. Nose: Fresh and floral with hints of violet and honey. Stewed berries with a scoop of vanilla ice cream. Butterscotch. Palate: Roasted chestnuts and black pepper. Apricot jam, quince and a whisper of cinnamon. Finish: Sodabread with salted butter, floral malt once again, cumin and dried raspberries. 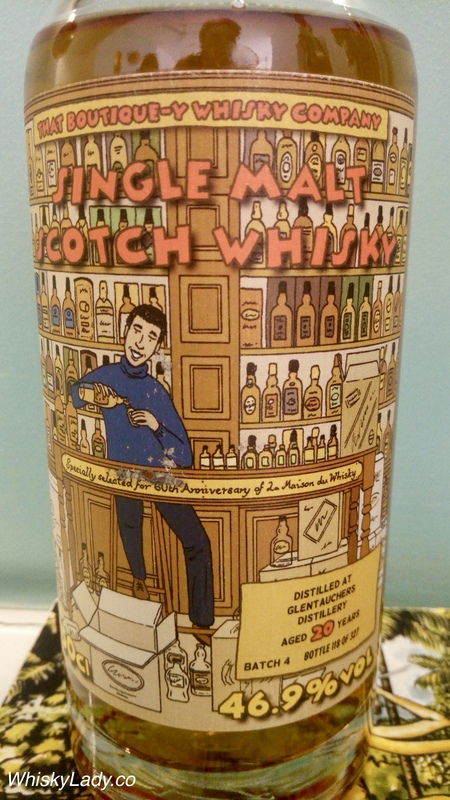 This entry was posted in Scotland, Speyside and tagged Glentauchers, Glentauchers 20 year, La Maison du Whisky, That Boutique-y Whisky Company by Carissa Hickling. Bookmark the permalink.